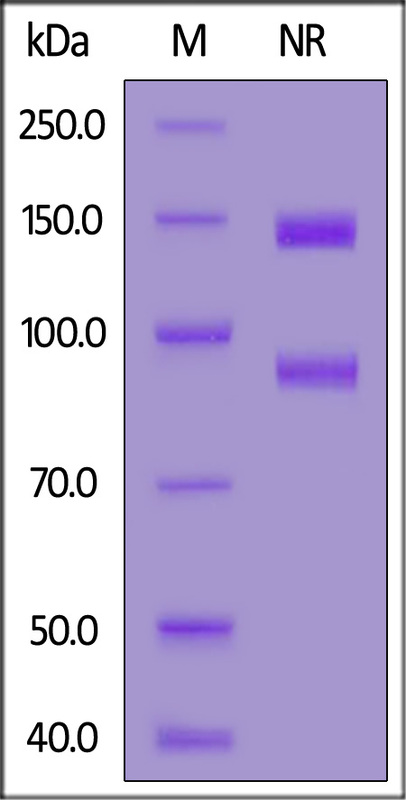 Human ITGAV & ITGB3 Heterodimer Protein (IT3-H52E3) is expressed from human 293 cells (HEK293). It contains AA Phe 31 - Val 992 (ITGAV) & Gly 27 - Asp 718 (ITGB3) (Accession # NP_002201 (ITGAV) & AAI27667.1 (ITGB3)). Human ITGAV & ITGB3 Heterodimer Protein, produced by co-expression of ITGAV and ITGB3, has a calculated MW of 113.0 kDa (ITGAV) and 81.8 kDa (ITGB3). Subunit ITGAV is fused with an acidic tail at the C-terminus and followed by a polyhistidine tag and subunit ITGB3 contains no tag but a basic tail at the C-terminus. The non-reducing (NR) protein migrates as 120-145 kDa (ITGAV) and 85-95 kDa (ITGB3) respectively due to glycosylation. Lyophilized from 0.22 μm filtered solution in 50 mM Tris, 100 mM NaCl, 2 mM CaCl2. Normally trehalose is added as protectant before lyophilization. Human ITGAV & ITGB3 Heterodimer Protein on SDS-PAGE under non-reducing (NR) condition. The gel was stained overnight with Coomassie Blue. The purity of the protein is greater than 95%. 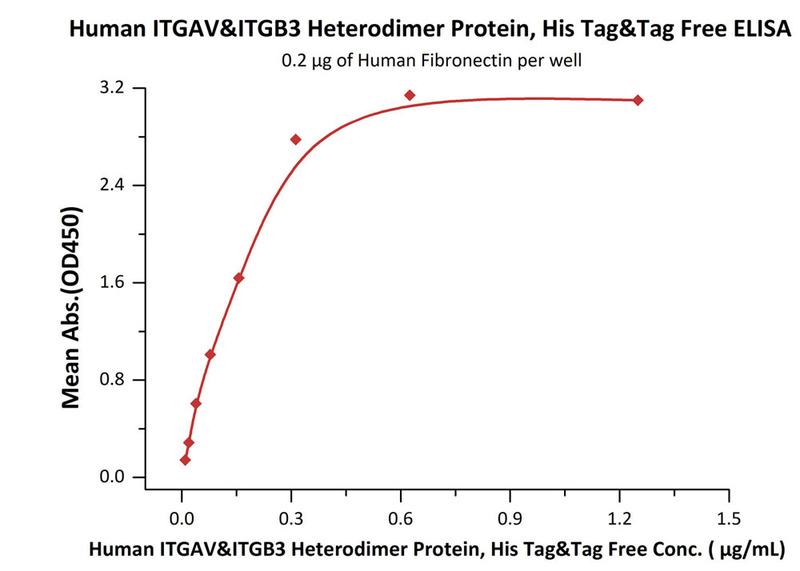 Immobilized Human Fibronectin at 2 μg/mL (100 μL/well) can bind Human ITGAV & ITGB3 Heterodimer Protein (Cat. No. IT3-H52E3) with a linear range of 0.01-0.313 μg/mL (QC tested). 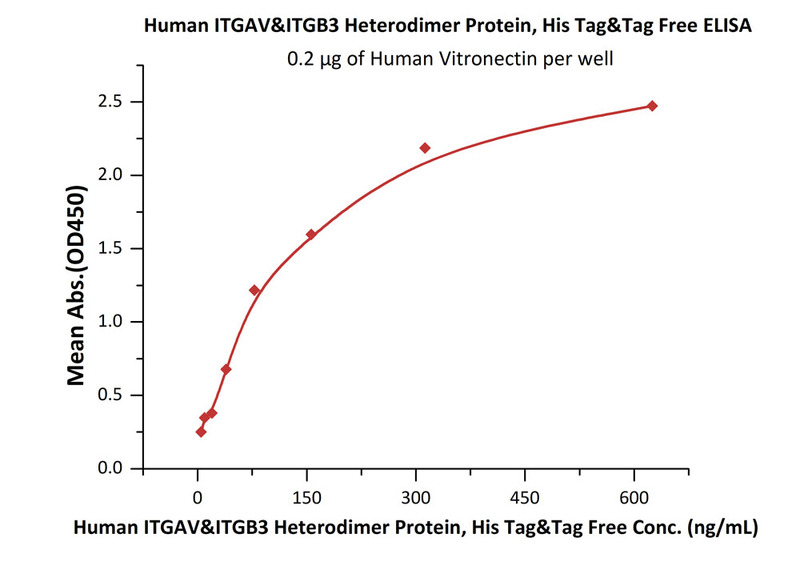 Immobilized Human Vitronectin at 2 μg/mL (100 μL/well) can bind Human ITGAV & ITGB3 Heterodimer Protein (Cat. No. IT3-H52E3) with a linear range of 10-156 ng/mL (Routinely tested). Integrin alpha-V/beta-3 (ITGAV:ITGB3) is a receptor for cytotactin, fibronectin, laminin, matrix metalloproteinase-2, osteopontin, osteomodulin, prothrombin, thrombospondin, vitronectin and von Willebrand factor. Integrins alpha-IIb/beta-3 and alpha-V/beta-3 recognize the sequence R-G-D in a wide array of ligands. Also, Integrin alpha-V/beta-3 acts as a receptor for herpes virus 8/HHV-8, coxsackievirus A9, Hantaan virus, cytomegalovirus/HHV-5, human metapneumovirus, human parechovirus 1 and west nile virus. Furthermore, in case of HIV-1 infection, the interaction with extracellular viral Tat protein seems to enhance angiogenesis in Kaposi's sarcoma lesions. (1) Kumar C.S., et al.,1997, J. Biol. Chem. 272:16390-16397. (2) Bledzka K., et al., 2010, J. Biol. Chem. 285:30370-30374. (3) Wei Y., et al.,2014, J. Virol. 88:4338-4352.